received 8 logs, 1 check log. Six Yls, 3 OMs submitted logs. Congratulations to you all for taking part and a special Thank-you to our supportive OM friends. On the up-side we met a local yl Wendy (ZS5WZ) and OM Mike ZS5MAB. I have many more questions and no, none, nothing answers. But am determined to find some. Ed: Ladies - we need your input, send your thoughts and pics, share your stories with us (please). 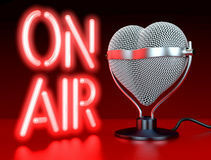 How to get ladies on the air? You HAVE to use the mic. Most of us were mic-shy but with practise it does get easier. Call into your local bulletins or nets – usually you only need to give your call-sign (that’s easy) and say”thanks for the bulletin”. Contests (no don't throw your hands up) are easier than you think. Just answer those operators calling. They want the points and will do most of the work. They need your call-sign, signal report (you will notice they are all 59!) and will tell you what else they need. They don't have time to chat. It allows you to practise, with no stress and you will gain exposure and credibility. Try it – isn't this why you got your license? PS: Annette ZR6D will be reading the SARL Sunday bulletin in Afrikaans, 18 September, listen out for her. The contest runs from 12:00 UTC on Saturday to 12:00 UTC on Sunday. Single and multi-operator stations may operate for the entire 24-hour period. There are no mandated breaks in operating time required. All bands, all modes. Every Saturday afternoon 14UTC 14.260Mhz - with V51MA, MIKE in Namibia; ZS6MHK, THINUS in South Africa and A25SL, LEON in Botswana. DXNET Controllers operate from 3 different countries as conditions allow Although not too far apart - its something special for international DX as well local participants. Africa DXNET is NOT related to ANY Organization. It is purely for loads of fun. If you hold a ZU license and are older than 25, your license will expire on 31 March 2017 and will not be renewable. ICASA recommends that the affected persons enrol for a Class A license course and write the next RAE in October 2016. The revised regulation stipulates that persons under 20 years old can write the Class B examination and if successful, can hold a ZU or Class B license until 25 years old after which, if they would like to continue with Amateur Radio, they have to sit the Class A examination to qualify for a Class A license. On 31 March 2017, the grace period that the SARL negotiated with ICASA expires. ELIGIBILITY: All licensed women operators throughout the world are invited to participate. YL groups/clubs may also may also participate provided the YLs operating are listed at the end of the log. Only YLRL members are eligible for the Corcoran and Hager awards. OPERATION: All bands may be used except WARC bands. Contacts with OMs do not count. Hear about ARDF, Auroras or 23cm; restore Old Radio Sets ; go on a DXpedition to the remote South Georgia and South Sandwich Islands; learn about Contesting from Prince Edward Island; the 5 MHz Experiment; and how to assess HF antennas. Learn about ARDuino, SDR, transverters, Raspberry pi, datamodes and oscillators and MORE!. For those who prefer Hands-on, there will be a Buildathon & workshops. Started in 2008, this will be the 8th ROTA event. The Bishop Auckland Amateur Radio Club co-ordinates the event. ROTA 2016 will be held over the weekend of 24th - 25th September. Suggested radio frequencies for the event: 3.65, 7.12, 14.12. The Society was formed in 1966 (50 years ago) by a few railwaymen with a common interest in amateur radio and has continued to grow with the present membership currently around 70. It is part of a much larger organisation called FIRAC (Federation International Radio Amateur Cheminot) cheminot is French for railways. 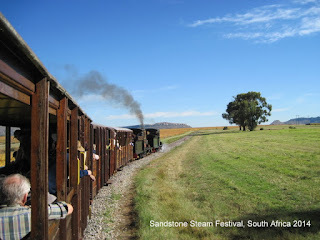 The aim of both organisations is to promote friendship amongst people who have a common interest in both railways and radio. The International FIRAC Congress of 2016 will be held in Derby, UK on 15th-19th September. was formed after a meeting of radio amateurs from Switzerland, Germany, France and Denmark in Geneva on the 18th Sept 1960. In 1964 the German Railway Radio Amateurs organised the first official congress in Hamburg on the 20th September. It was a bold move and the final outcome of was the formation of FIRAC. The organisation promotes radio activity between other railway radio amateurs worldwide and continues to grow. Currently the membership is around 2500 from 23 countries. Another Railways on the Air event will be held on Saturday 12 November, 2016: 8º Jornada Radial Ferroviaria Argentina. The Rev Wilbert Awdry (1911-1997) - the clergyman who created 'Thomas the Tank Engine' invoked an affection for railways among millions of children - died March 21, 1997 age 85. The war against Hitler was still in full spate on the day in 1943 when Wilbert Awdry settled down at the bedside of his ill two-year-old son Christopher to tell him a story, and drew from his imagination the tales of three steam engines which hailed from his fantasy 'Island of Sodor'. In 1945, The Three Railway Engines was published, becoming a huge success and resulting in a further 26 Railway books being published. Between 1943 and 1972, Wilbert Awdry wrote 26 books in the 'Railway Series' - diversifying away from the engines of Sodor to pick up on aspects of the railway preservation world in which he had a particular interest. No-one - and certainly not Wilbert Awdry himself - could ever have dreamed then of the impact that his imaginary 'engines with faces' would one day have on the wider world, leading in the 1980s to the purchase of the 'Thomas' franchising rights from the publishers and the subsequent creation of an animated children's television series. Translated into many of the world's languages, “Thomas the Tank Engine and Friends” has become an international pop culture icon.
' 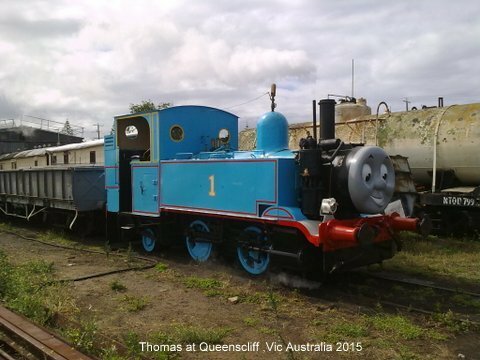 Day Out With Thomas' events provides opportunities for kids to take a ride in their favourite tank engine and meet the railway controller Sir Topham Hat. Such 'special' days are not restricted to the original home country of Great Britain, but are spread across the United States, are hugely popular in Japan, Europe and elsewhere. 27-28 Aug ALARA CONTEST (Australian Ladies.) last FULL weekend of August.